Safe Communities of DeKalb is led by the DeKalb County Board of Health and is supported by the Governor’s Office of Highway Safety. Safe Communities is a model used by communities all across the country to identify and address local injury problems. It promotes injury prevention at the local level to solve local highway and traffic safety problems. Safe Communities are grounded in two basic principles. They are founded on the goal of reducing traffic injuries and are dependent upon a diverse group of partners for their success. Safe Communities of DeKalb has a wide-ranging focus that addresses Pedestrian Safety, Road Redesign, Driver Behavior and Data Collection and Analysis. 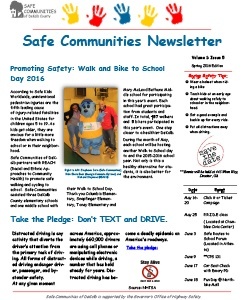 Two of the primary focus areas of Safe Communities are Pedestrian and Child Passenger Safety.